If one opts for the ‘Round-the-trip Cruise’ this full day cruise will cover all islands in the Ashtamudi backwater and the ‘See & Sleep Cruise’ option offers day cruise with overnight stay on the backwater. 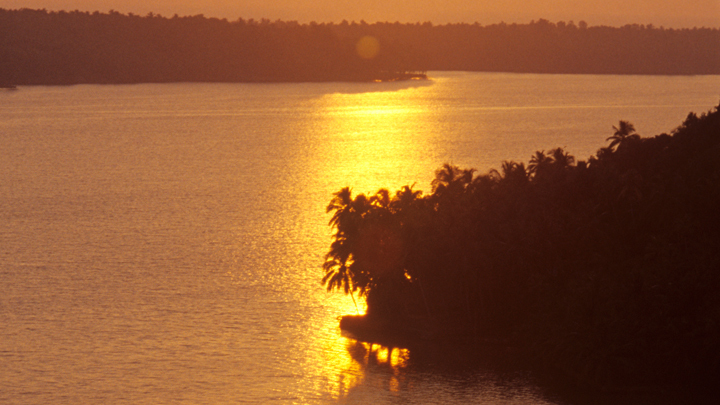 The third option ‘Star Night Cruise’ will take one for a fascinating sunset cruise and a night’s stay on the backwater. Opting for ‘Majestic Cruise & Resort Stay’ would take one on a houseboat cruise starting in the morning and reaching the Ashtamudi Backwater Resort towards evening. At the resort, facilities include A/c suite room accommodation and multicuisine dine. Next day morning, the cruise will leave the resort and head for the starting point in Kollam. ‘Elegant Cruise and Resort Stay’ would start in the morning and reach the Palm Lagoon Backwater Resort in the evening. Here, one can relax in the cottages in natural ambience, and can enjoy special seafood delicacies. Next day morning, the cruise will set off from the resort for the starting point. The third option ‘Serene & Resort Stay’ will have the cruise starting in the morning, which will later head for the Aquaserene Backwater Resort. The cruise will reach the resort in the evening, and after check-in one can relish the multicuisine dine. The cruise will depart the next day morning and would head for the starting point. This is yet another exciting package from DTPC Kollam, offering full day houseboat cruise with Kathakali performance at dusk and a night’s stay on board the houseboat. This cruise usually starts in the afternoon, and returns to the starting point the next day morning.